This is controversial but important. I hate to be the bearer of bad news, but ‘funnels’ are not (really) a thing. Funnels are just the process to take a person who has not come across you before, to becoming a subscriber, to becoming a client/customer, to becoming a repeat client/customer, to becoming a raving fan. 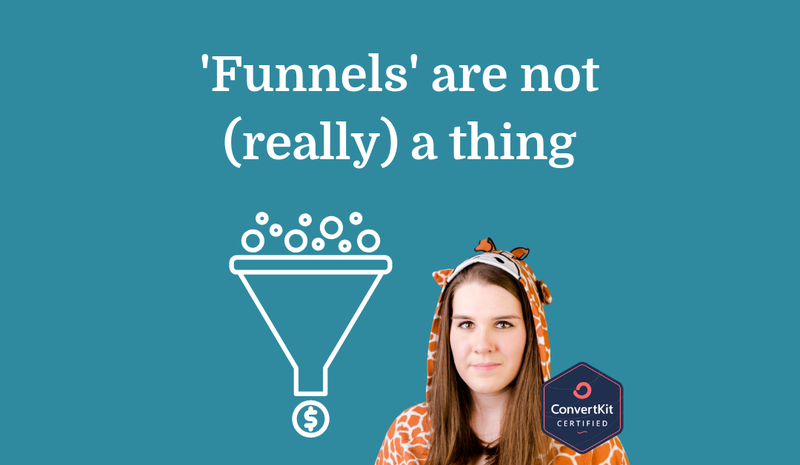 There are millions of ways to do that… and it’d be totally legit to call them all funnels. There are certainly different types of funnels e.g. automated webinar funnels, video series funnels, funnels that have a PDF freebie or an evergreen challenge and then pitch a course, etc, but even then those all mean wildly different things to different people. Funnels aren’t defined things that exist and then you fill in the blanks (as much as some internet marketers would like us to believe!) – they depend entirely on your unique business: what you sell, who your audience is, where your audience is finding you from, etc. The point of my telling you this today? 2) think that ‘funnels’ are something other people know about but you don’t, and you have to pay a ton to have some funnel expert teach you about funnels. The next time you go to say something like “I know I need a proper funnel to grow my business!”, I encourage you to get more specific about the hurdles you’re facing in your business and the possible solutions to overcome them e.g. You see the difference in how much more practical those questions are? Please do let me know if the comments if this post has resonated with you! Yesss. I’ve felt this way for ages. Thank you for putting it into words. I usually focus on what people ARE doing vs. what I WANT them to do, and then problem solve from there. ‘What if…’ is my favorite question.